Denver’s K-12 public school system has seen a number of positive improvements toward student success in recent years; however an achievement gap (when one group of students outperforms another group) continues to exist between students from low-income families and communities of color and their peers. The achievement gap is especially apparent in Southwest Denver. According to a recent report by A+ Denver, the region serves more than 22,000 kids (about 27 percent of the Denver Public School District) and has a 90 percent low income and 84 percent Latino population. The report also shares that only 15 percent of Southwest Denver students are college-ready by the time they graduate high school. For the past three years, Rose Community Foundation, in partnership with the Ford Foundation, has helped schools and communities in Southwest Denver and throughout the Denver Metro area implement innovative practices to work toward closing this achievement gap. The partnership’s investments have focused on an emerging practice called More and Better Learning Time. “Central to More and Better Learning Time is extending the school day to provide more quality time for activities that support academic achievement such as enrichment programming, student interventions, tutoring, and advanced classes,” explains Janet Lopez, Rose Community Foundation senior program officer for Education. Grant Beacon Middle School in Southwest Denver is one example of how these investments are making a difference. Three years ago the school faced possible closure. Today it has become a model for success, and its success is becoming a resource for other area middle schools. To turn itself around, with the help of grants from the Ford Foundation and Rose Community Foundation, Grant Beacon implemented an approach that includes an extended school day, blended learning (combining technology with one-on-one instruction) and a focus on character development. That combination of strategies has proven to be an ideal recipe for student success in a school whose student population is comprised of 85 percent free and reduced lunch eligible, 93 percent minority, 40 percent second language learners and 15 percent special education. “We have seen incredible academic growth. We are outperforming nearly all the charter schools in the area,” says Alex Magaña, Grant Beacon Middle School principal. The model is so successful in fact, that it is now being replicated. In a ground-breaking move, Magaña and his team will implement the “Grant Beacon” model at Kepner Middle School starting with the sixth grade class in the 2016-2017 school year. This is the first time a public “innovation school” will be replicated; something only charter schools have done before. “We already have a waiting list for Kepner, ” says Magaña, pointing to the significant enthusiasm and support he is seeing from parents and others in the Southwest Denver community. Similar to the way charter schools are managed, a new “Beacon Network” will serve as the managing organization over the schools. 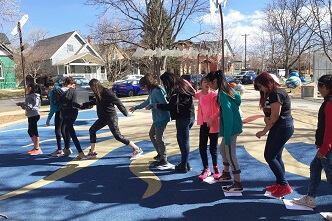 Learn more about Grant Beacon Middle School at https://rcfdenver.org/blog/grant-beacon-middle-school-success-story-k-12-school-innovation/.